The once small jungle town of Aguas Zarcas is becoming an increasingly popular tourist destination, thanks to its beautiful blue hot springs and incredible jungle scenery. Many people consider Aguas Zarcas a paradise. It’s a land of abundant fresh air, beautiful birds, tall flowers, and healthy rivers. The name of the town means “light blue waters,” which is exactly what the residents and tourists get to relax in at the end of a long day. Located near Arenal, Aguas Zarcas is perfect for those looking for a bit more privacy than that offered by Arenal, but still want the excitement of a growing community and the uniqueness of hot springs at their doorstep. There are homes both along the main roads and in more secluded areas. 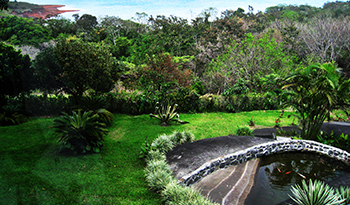 Privacy is not an issue in Aguas Zarcas; there is much land and jungle offering residents as much privacy as they like. The jungle separates properties from one another, provides shade, and produces beautiful scenery and wildlife. The most luxurious and desirable properties are found either nearest to the hot springs or farthest from the center of town, depending on one’s preference and how much space one desires. The properties near the hot springs are more convenient but tend to be smaller in size. To get the best jungle views, one has to be a bit removed from the town’s center. Investment opportunities include the purchases of farms, various commercial buildings, or a variety of businesses catering to the tourism industry, including bed and breakfasts, restaurants, tour services, and spas. Residents and tourists often remark that more hotels are needed in the area. About Krain Real Estate, Costa Rica Luxury Real Estate specialists. If you are looking for property in Costa Rica then contact us to see how we can be of assistance. If you are looking for a Costa Rica MLS or other information about affordable costa rica property then look no further. At Krain we have information about everything from beach front real estate in Costa Rica to the best international schools Guanacaste province has to offer. Did you know that our Costa Rica luxury property specialists can also help you with vacation rentals, tours and transportation as well? Copyright © 2016 KRAIN Costa Rica Limitada, All rights reserved.